Players are opposing gods from Greek mythology, Hera and Zeus, bent on destroying each other because each kidnapped the other's favorite mortal. Players lay out cards in opposite three-column, four-row matrices. Cards on the leading edges of the opposing columns can be used to attack, which means the combat value of the cards are compared and the loser is destroyed. However, cards are played facedown until they're engaged, adding an element of bluff and doubt to the game. Each turn, players have as many actions as they have columns, and actions can be used to attack, draw cards, or play special action cards. To win, you need to reduce the other player to zero columns, capture their hostage card from their hand, or make sure your opponent cannot use all of their actions during their turn. 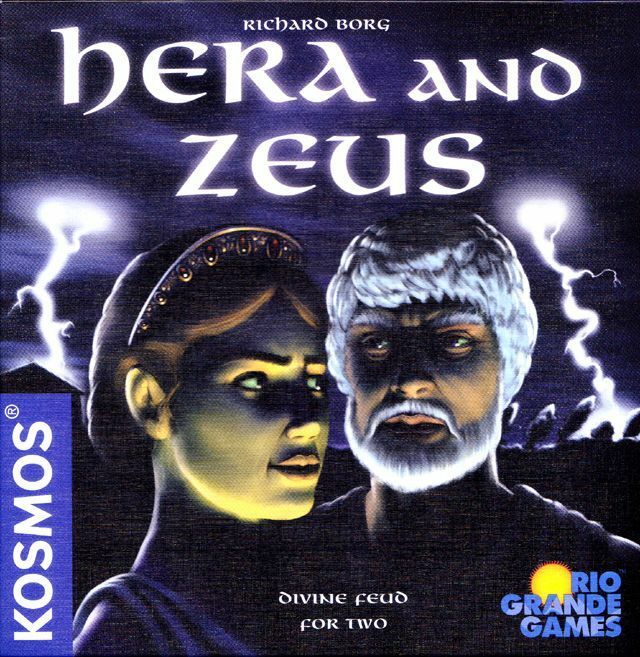 Hera & Zeus is part of the Kosmos two-player series.